Amazon Firestick and Fire TV are very easy to set up. Simply plug into the HDMI-in port on your TV set. Use the HDMI Extender for more convenient access and the best Wi-fi reception. Everything is powered up by plugging the power adapter into a wall outlet (do not use USB power, particularly with the Fire 4K TV). Internet Connection: You can connect to your Wi-Fi Internet signal; however for the best results, hardwire to your router with an Ethernet Cable adapter (order separately, below); which is highly recommended. 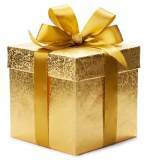 To understand why a wired setup is better, you might want to visit Wireless and Wired Networks. But if you decide to go wireless with your Fire TV, read all about home networks and the best router to get here: Home Networking Tutorials. 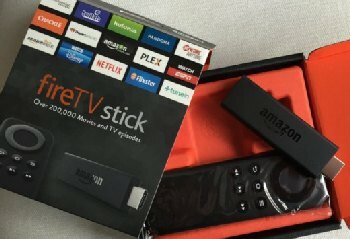 Amazon claims that Fire gives you access to over 500,000 movies and TV episodes from Netflix, Prime Video, Hulu, HBO Now, SHOWTIME, NBC, and many more. It can also be used to surf online to sites such as YouTube, Facebook, and Reddit; with browsers like Silk and Firefox. Stream music from Pandora, Amazon Music, and iHeartRadio; watch videos from Facebook, Vevo, and Vimeo, or play hundreds of games from Mojang, EA, Disney. 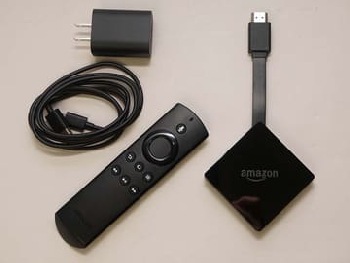 Although not the best-seller on the market, Amazon Fire TV streaming devices remain a very popular entry in the "streaming device" wars. Ease of use, low cost and name recognition (Amazon) have helped keep Amazon Fire competitive. Amazon Fire streaming players are unique in their strong affiliation with Amazon products and services; particularly Amazon Prime Video (a huge supplier of good movies), and Amazon Music. It works seamlessly with the Amazon Echo Smart Speaker systems. Alexa Voice Remote has probably the most accurate universal search of the major streaming devices. "Alexa, play Ozark on Netflix." You can link the TV control to your Alexa Echo smart speaker and thereby control Smart Home devices and other functions from the TV remote. Or, control your TV viewing by giving commands to your Alexa Echo. Amazon Prime membership includes no-added-cost access to Amazon Prime movie Videos, TV episodes, Thursday Night Football, Amazon Original Series, Amazon Channels, and ad-free Prime Music. Heavily biased towards Amazon products and services; even shows some advertising banners. Does not allow you to search free (Prime) movies separately; you must make a selection first to find out if it's free or pay. Not very convenient. Highly recommended Ethernet Cable Adapter must be purchased separately ($15, see below). It used to come free with the earlier edition Firesticks. We have Firesticks on two of our televisions and are very happy with them. To learn more about these devices and read lots of honest reviews, you may click on our Amazon affiliate links below. And we have the Amazon Fire TV on our main TV; works great! You'll need one of these if you want to hardwire your Amazon Fire Device. Compatible with Fire TV Stick (2016 release) and all-new Amazon Fire TV (2017 release). Compare the Amazon Fire to Google Chromecast. 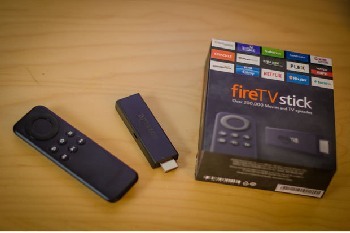 Compare the Amazon Fire to Roku Stick. Compare the Amazon Fire to Apple TV.